Here is one of the earliest models of brigandine, which refers to the turn of the XII-XIII centuries. 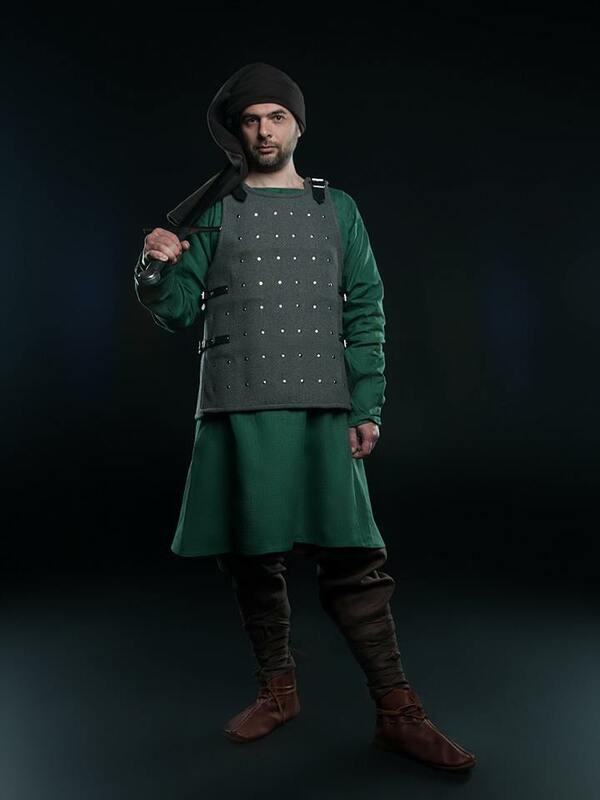 We guess you are aware that first European brigandine armor was amateurish attempts to copy Eastern lamellar armor. Invading the Holy Land to Holy Sepulcher, knight-crusader were developing that his heavy chainmail and surcoat protect against sun well, but provide with quite weak protection from arrows and other weapon of damned Saracens. In their turn, damned Saracens were protected with plates’ armor, which is lighter and more functional, than chainmails of Lord’s soldiers. Some knights succeeded to rob Saracen’s corpse in order to sack an armor, but most part of warriors went in chainmails. 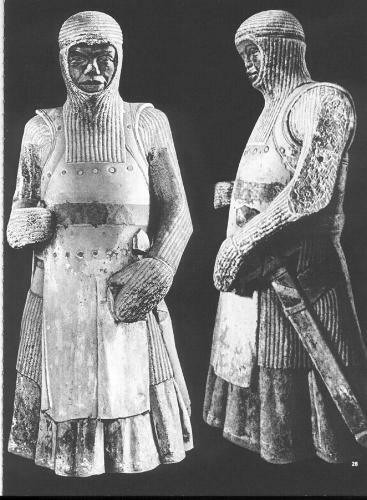 European blacksmiths were a bit afraid of beginning of “complex and time-consuming” process of lamellar armor making. They preferred “fast and easy” making of chainmail. Finally, the most brave of them, inspired by future glory and heavy knights’ fists, began to make own plates’ armor, not too beautiful, but with good protection level. In particular, brigandine armor. 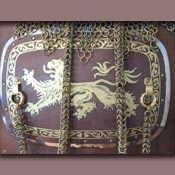 Early European brigandines had a look of few metal plates, riveted to the inner side of surcoat. Well, we must be thankful for small. One of such work is St. Maurice Coat of Plates. You can see it at statue of St. Maurice in Cathedral of Saints Catherine and Maurice Magdeburger Dom, Germany. That is which we can call “poorly, but purely”. Though, no need to laugh, as luxury Munich brigandine began with it. But, it is long time before its appearance so let’s back to our Coat of Plates. Even such simple model, which we can observe at St. Maurice, were adding many points to the knight’s protection level. So, inspired blacksmiths started to make brigand armor. In time, quantity of plates were increasing and their sizes were becoming larger. Buckles appeared on the sides, but then they moved to the chest or back (depending on the model). Most part of models had belts with buckles on the shoulders that allowed fitting of non-custom-made brigandine. 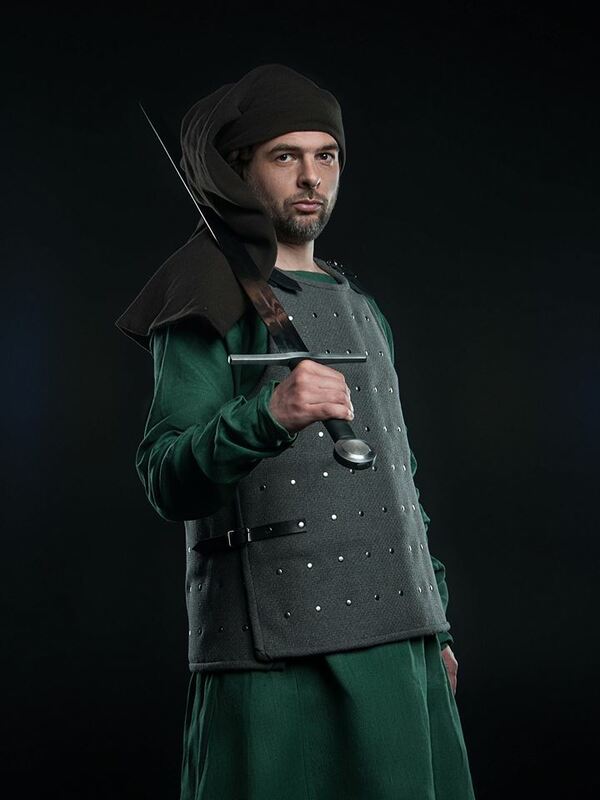 Thus, here is of the earliest brigandine armor, with buckles on the sides and shoulders and good protection level. 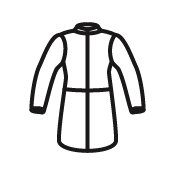 It consists of three layers: linen or cotton inner layer (by your choice), metal rivets and then sound clothing wool, dressed with canvas cloth. Color of wool you may choose by your wish, or change fabric to velvet or leather. Steel Mastery will cater to it. 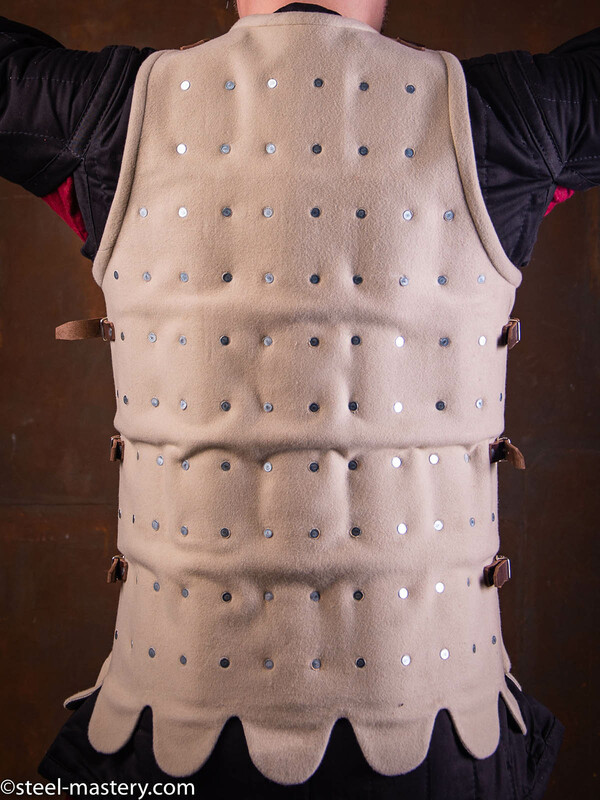 We can offer different variations of outer material for SCA brigandine armor, in which you will not only look perfect, but also perfectly protected. Various fastenings and types of decoration are available for order. 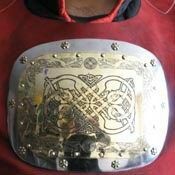 We can make an embroidery of your heraldic emblem on the brigandine, or decorate the bottom edge with fancy festoons. 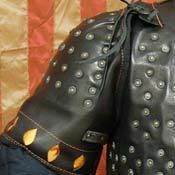 Brigandine or whole-hammered spaulders provide with additional protection. If you choose half-coloured or quarter-coloured brigandine, please inform us via [email protected] , what colours you prefer and its exact disposition. 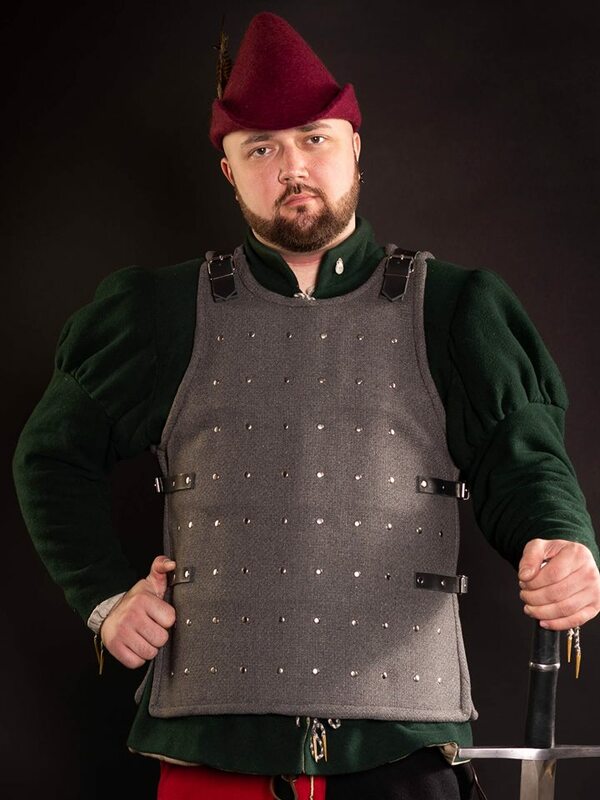 You may also like these models of battle armor: Royal brigandine for SCA and fencing, European brigandine of the XIV-XV centuries, Leather brigandine of the early XV century. In section “Brigandines”, you can see all models of brigandine armour for sale. If you didn’t find any for your taste, wish and needs, please send us photo and description of the required model and we will make it for you. 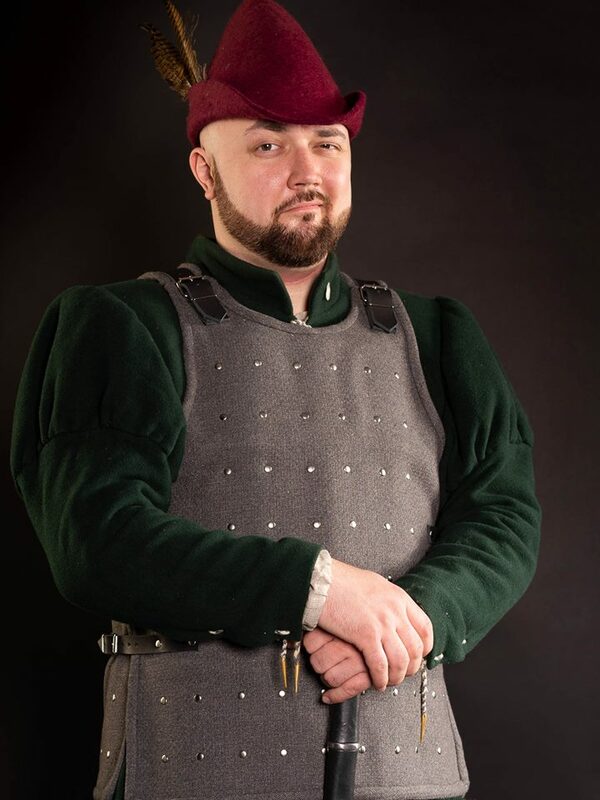 European brigandine of the XIV-XV centuries was used both as by the representatives of noble birth, so by commoners-foot soldiers. It protected body at the highest level during the combat. Depending on the fabric and decoration, it could be a real regal armor. 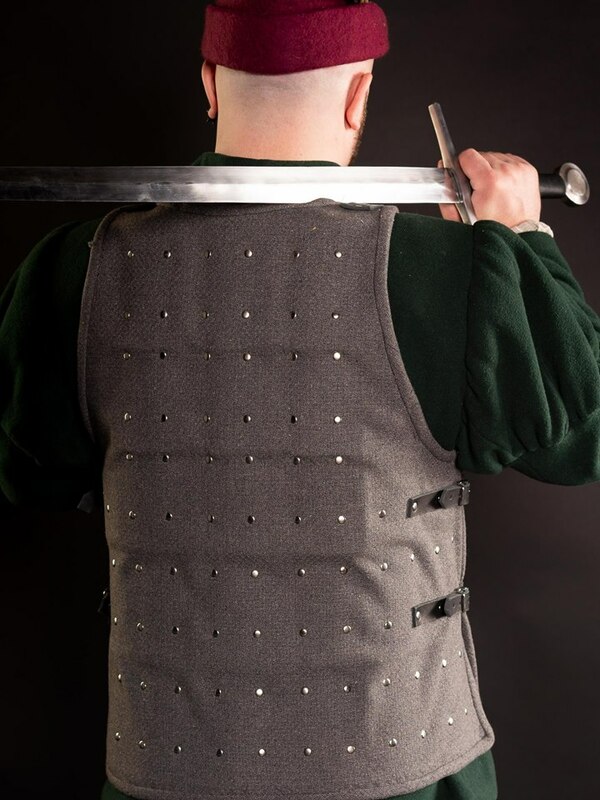 Pattern of this brigandine is based on the scientific publication "The riders of the war. European Cavalry" by Aleksinsky, Zhukov, Butyagin, Korovkin, 2005. 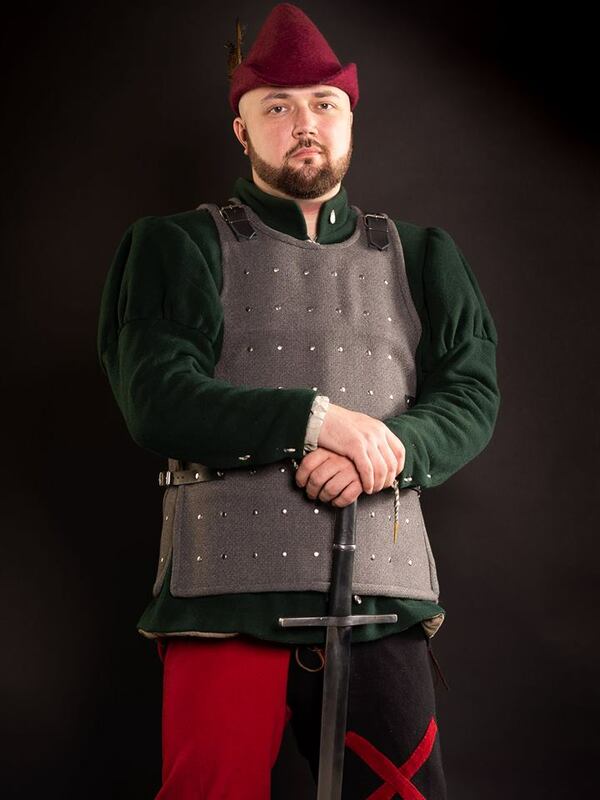 You can use this brigandine armor for: SCA HEMA Larp Stage performances Medieval festivals Reenactment events Made-to-measure brigandine is completely handcrafted. 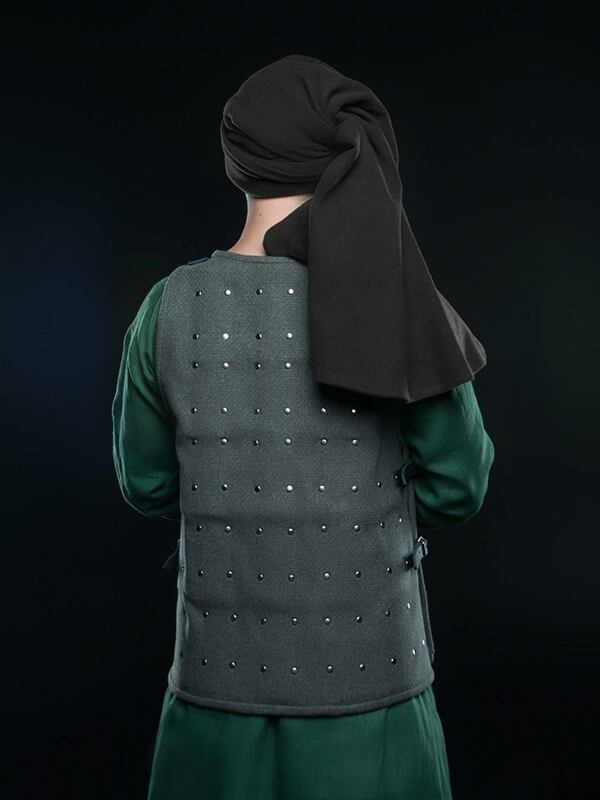 Fastenings from the front and on the shoulders allow easy and comfortable wearing of brigandine without external assistance. Base price includes following options: Black wool for outer shell; Cotton for inner shell; Plates of cold-rolled steel 1.0 mm; Steel finding rivets; Black leather straps; Steel nickel-plated buckles; Straight bottom edge; XS-size; No decoration; We offer you to order really u..
Leather brigandine protection of upper part of arm Bicep is beautiful. Bicep is courageous. Bicep is brutal. However, if it is adorned with all shades of bruise or is slashed, so it is absolutely unbeautiful, unmanly and not brutal. It is painful, unpleasant, and unnecessary for you at all. 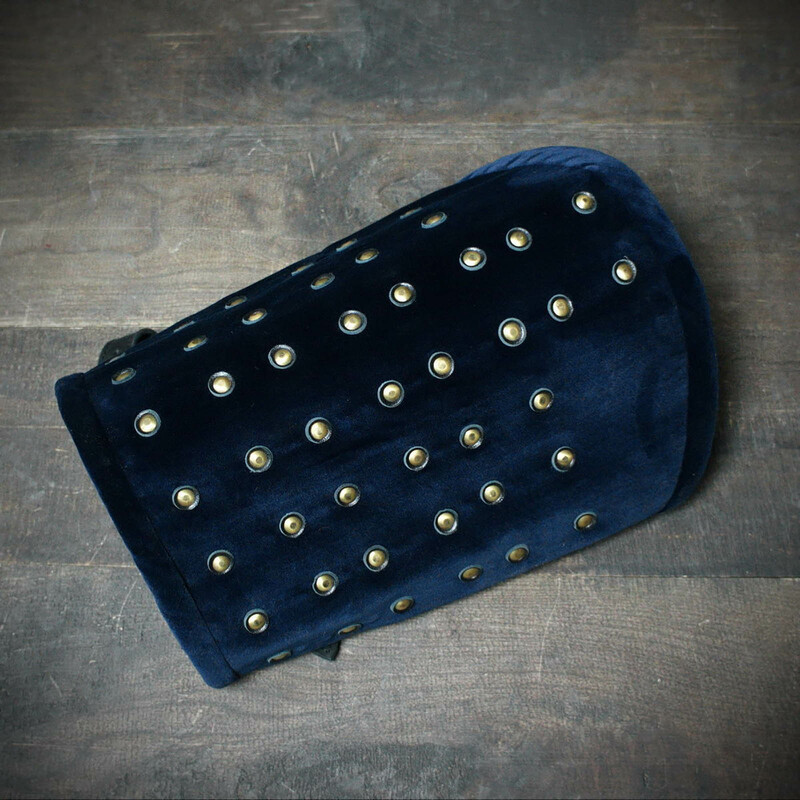 Therefore, in order to protect your biceps against enemy’s weapon, our blacksmiths made this piece of functional leather armor - brigandine protection of upper part of arm. Cold-rolled steel plates of 1.0 mm are riveted from the inner side of matted firm leather. 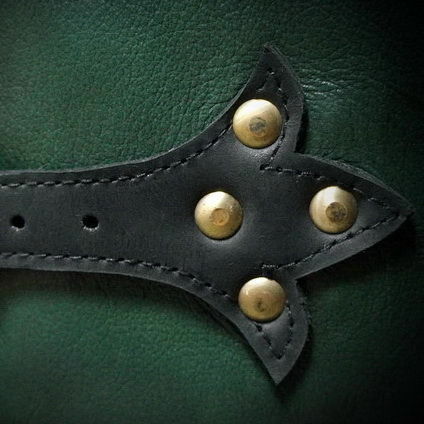 Additional leather strips are riveted from the outer side. 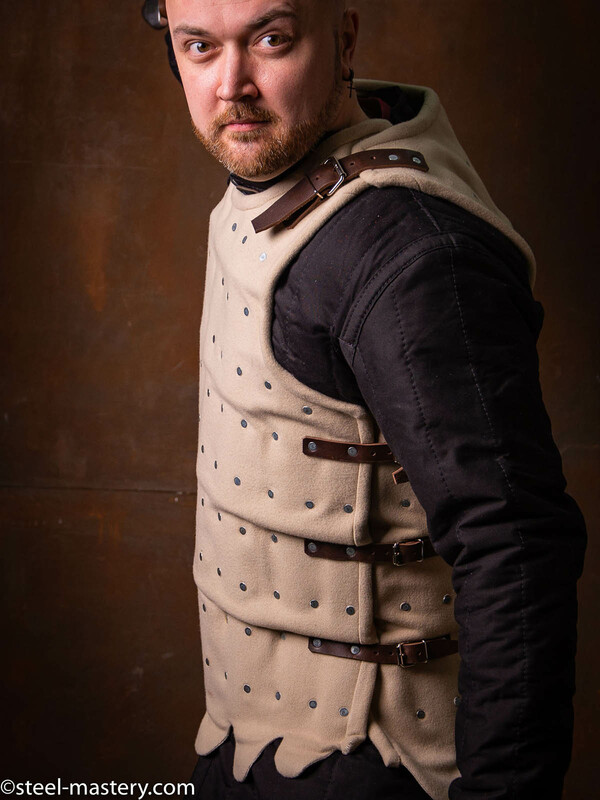 Leather straps overlap meeting point of plates to increase protective qualities of this medieval leather armor, not leaving your enemy a single chance to reach your bicep! Buckles and rivets are steel by default. However, you may choose color of leather, material for buckles and rivets, type and thickness of metal for plates in options. Steel Mastery is on guard of your biceps! :) ..